Nauplius Workboats has started the production of two completely new designed Landing Utility Vessels for Marine Harvest. The fish farming industry’s growth has led them further expanding their fleet. Innovations were made to ensure higher productivity and an easier workflow. The ships will be delivered in 2018. Nauplius Workboats is a Dutch based contractor for workboats that works globally. The custom build Landing Utility Vessels will be delivered to the fish farm sites of Marine Harvest in Scotland in 2018. Earlier corporations created the foundation for this new contract. Fish farms are dynamic floating structures, that help supply the growing demand for fish. Currently, more than 50% of the total fish supply in the world comes from fish farms and they are indispensable and innovations are key. A traditional landing craft has the deckhouse on the aft while the N009 and N010 have the deckhouse on the side. This creates workspace available at the fishpen over the full length of the vessel. Workflow will improve with the widened beam up to 7.25 meters. This makes it possible to install a larger crane of HS Marine which has a maximum capacity of 1480 kg @ 15,09 meter. Both workboats have a larger depth, this makes it possible to install accommodation below deck with two sleeping cabins. The Volvo Penta main engines and the more than 100% increased capacity of the generator, which is now 100 kVA with a front end connected hydraulic pump of 100CC @ 290 bar, will enable higher electrical and hydraulic power supplies on deck. Quality and smart design is common divider in all the decisions that led to Nauplius Workboats latest design. This vessel has been designed by Argos Engineering B.V. and the landing utility vessel concept is unique in the market. This vessel is a crossover between a traditional landing craft and a Multi Cat. 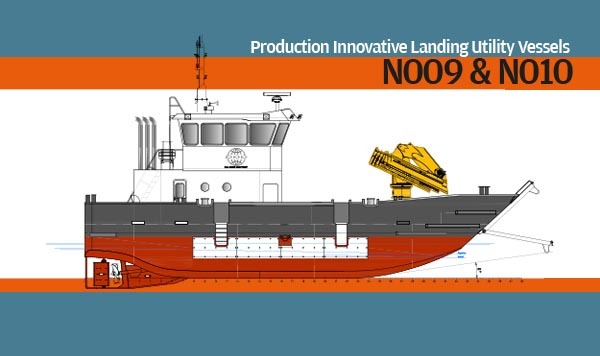 This designs combines the traditional deck layout of a Multi Cat with the bow of a traditional landing craft which will enable the N009 and N010 to load easily on slipways. ‘Due to the versatile design it is, with some minor adjustments, also possible to use this concept in other markets especially where quays are not readily available and slipways are more common.’ says Gerrit Knol, Technical director Nauplius Workboats. This MCA Workboat vessel with an operational envelope of 60 miles from a safe haven. Essential for this vessel was also that it should be fully metallized and antiseptic where possible to minimize the risk of contamination of the fish.